I’ve had a long, hard week. How about a picture of some hairy guys wearing feed sacks to cheer us all up?! It’s not dated but it must be from a time when feed sacks were still readily obtainable in Houston. Sarah Lane Literary Society, so sometimes between 1947 and 1965. I’m guessing late 50s. Well, the guy second from the left sure looks like me but I have no memory of the event. 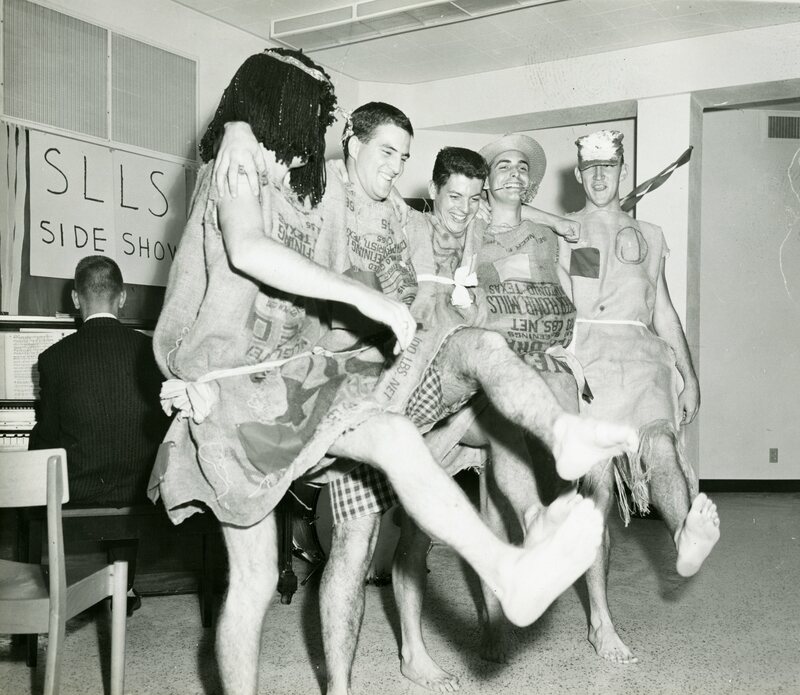 I did serve as MC for a couple of Rice Follies back in the mid-50’s. Second guy from right is wearing a sack from Pioneer Flour Mill in San Antonio. Probably not burlap; flour would go right through it. Second guy from the right I think is Hal Gosnell and one on the right is Tom Mckown. Gosnell was from San Antonio so you are righta on with the flour sack. Would be in late 50’s as both Tom and Hal graduated in 1960.